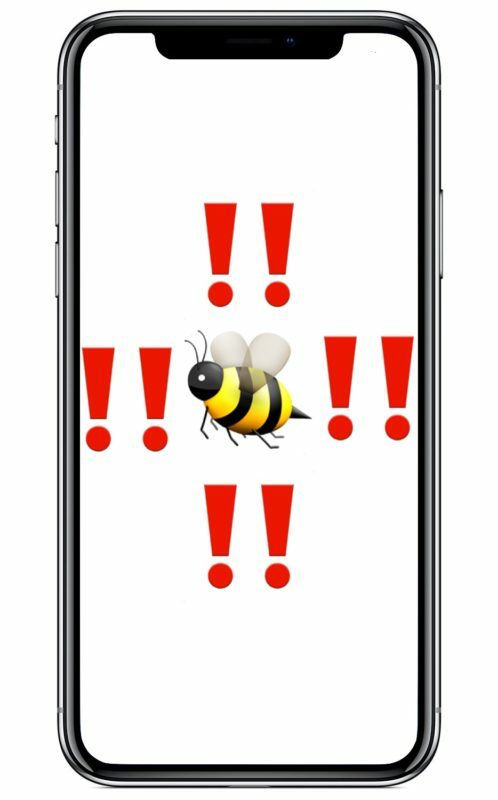 The iPhone defaults to having two kinds of alerts, an auditory alert and a vibration alert, so if your iPhone is ringing or getting a message then your phone will make a sound as well as buzz. If you flip the Mute switch on the iPhone, then the auditory alerts will silence, but you’ll still get the vibration alerts. That default state may be ideal for most iPhone users, but some others may prefer to have absolutely no vibration coming out of their iPhone at all, ever. This article will show you how to completely disable all vibrations on the iPhone. By disabling vibration system-wide in iOS, every situation you’d normally get a buzzing vibration as an alert or a notification will no longer vibrate ever. This makes it so if the iPhone is not on mute mode, then the auditory alert still kicks in but without a physical vibration, and if the iPhone does have the mute switch enabled then there is neither an auditory alert like a ringtone or text tone, nor a vibration. The iPhone will be truly completely silent and offer no physical indicator that an alert is going on. Note this is somewhat extreme as it stops all vibration on the iPhone entirely, disabling them everywhere, meaning within all apps, all alerts, all messages and incoming calls – everything will no longer vibrate at all. If you simply want to turn off vibrating on text messages and iMessages in iOS you can do that instead with these instructions. Exit out of Settings and you’ll now find that no matter what type of incoming alert, notification, or other activity, there will be no vibration coming out of the iPhone at all. 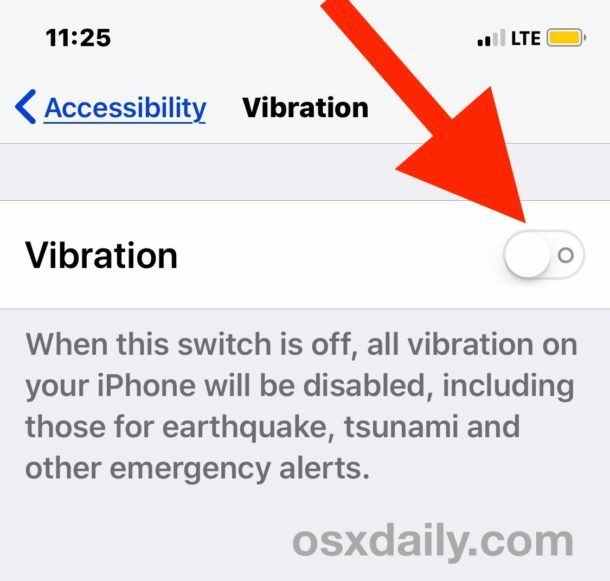 You’ll need a vaguely modern version of iOS to have this capability in your iPhone device settings, as older versions do not have a general vibration disable switch. Now all vibrations will be enabled again – unless you disabled vibrations for Messages in iOS in which case those would still be disabled, but other vibration would be enabled again. This is a setting that will vary per user, and if you like vibrations there is no reason to turn them all off. If you do like the vibration features, one of the most interesting ways to customize your iPhone is to create and set custom vibration alerts per contact on the iPhone, which allows you to make unique vibration patterns for individual contacts. Essentially that allows you to identify who a caller or contact is by feel alone, which is undeniably useful for so many situations, and can offer you tactile feedback to know who is calling you, even if the iPhone is in a pocket. Good thing these Apple design morons keep moving settings functions, otherwise what would osxdaily have to post about!!!!!! Seriously though, this constant moving of such basic functions is getting more than annoying, it’s IMO disrespectful to Apple users who are getting very tired of having to search for basic functions only because Apple moves them. This is nice but I don’t want to have to turn off all vibrations to get the effect that I am looking for. I want to be able to fully mute the iPhone without vibrations or sounds, but also toggle it back on. So I personally want a Settings option to be able to let the “Mute” switch ALSO mute vibrations on the iPhone. That would be great. When a phone is set to vibrate, it helps to loosen the accumulation of dust and dirt inside the phone by it dropping out of the speaker holes.